Do you know why betting on your favourite team is a bad idea? It’s for the same reason lotteries are so popular and people find judging the likelihood of rare events, like a hole-in-one, so difficult. It comes down to skewed perception resulting from what are known as the Possibility and Certainty Effects. Though all of the options represent the same quantitative change (a 5% improvement) they produce different qualitative impressions – in other words, each option generates a different emotional reaction. 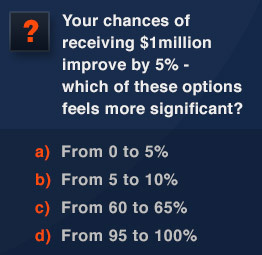 Option (a) moves you from no chance of winning the $1million to having a chance. And though it is a small one – with a probability of 0.05 – the move into the realms of possibility is a crucial trigger to positive emotion. This feeling is known as the Possibility Effect, which generally leads gamblers to overweight long shots, and is a driving force behind lottery participation which, for a small outlay, offers the a chance of a huge win. Options (b) and (c) tend to have less dramatic impressions. Even though with (b) your chance of winning actually doubles, it still doesn’t provide a qualitative impact – it doesn’t push the same mental buttons. With option (d) the outcome moves to certainty (100%), producing an inverse of the Possibility Effect. This is known as the Certainty Effect, which means that, in the absence of EV calculations, outcomes close to certainty are generally underweighted in relation to their probability. Despite the benefits of weighting the probabilities, bettors still tend to choose to bet on team A over team B because they believe it is a more likely occurrence, not from a calculation of superior value. Further to this, studies have shown that the objective use of probability in assessing outcomes declines where subject matter evokes a vivid emotional representation of an outcome, or the phrasing of a bet demands specific focus. In relation to our lottery example, who hasn’t had the following idle discussion – “what would you do if you won the lottery?” This is an example of generating a vivid fantasy of an unlikely outcome. This inevitably leads you to overweight the probability of scooping the jackpot. For the same reason, betting on your favourite team or player is a bad idea as your emotional attachment generates more vivid projections of the desired outcome – thinking the ball into the net – overweighting the probability. When a bet is worded in clear terms, it’s easier to make an Expected Value calculation – estimated or explicitly worked out – so weighting will be close to or match probability. Subtle variations in the way bets are phrased can however make a difference to the interpretation. For example, outright markets can be phrased as either, ‘Player A vs. the field’, or as a long list of all participants including Player A (e.g. Player A: 3.201, Player B: 9.454, Player C: 11.232, etc.). The first option offers a simplistic presentation of the task for Player A, which causes a cognitive overweighting of his probability of success. The second option – despite being exactly the same probability – seems a more daunting prospect, simply because the opponents that Player A must overcome are listed. This leads to an underweighted assessment. One study in 1999 by Craig Fox and the late psychologist Amos Tversky clearly demonstrates this. They asked a group of US basketball fans to assess the individual chances of the eight quarter-finalists in the NBA Playoffs. Judgement without recourse to proper calculation, leads to underweighting of probability. As the focus was solely upon assessing the chances of just one team at a time, and because as NBA fans they generated vivid impressions of each team, the aggregated probability for the outcomes was significantly overweighted at 240% for the eight teams. Of course, it should have been 100%. When asked to just assess the chances of a winner from the Eastern Conference or the Western Conference probabilities were very close to 100%. This was because the two options generated less emotional response and were equally specific. An infamous betting coup by two punters in 1991, who became known as the Hole In One Gang, neatly illustrates how the inability to visualize a rare event, and how judgement without recourse to proper calculation, leads to underweighting of probability. The pair, after intensively analysing statistics, calculated that the odds of a hole-in-one occurring at a European Golf Tour event were roughly 2.25. Armed with this knowledge, they toured the country targeting independent bookmakers and requesting odds for a hole-in-one being recorded at televised golf tournaments. These small operations didn’t have sophisticated risk assessors so put their finger in the air – i.e. simply relied on an intuitive judgement. The bookmakers figured that a hole-in-one was a rare event, as they had little or no experience of one happening either personally (for those that played golf) or from television, where limited coverage meant that every tee-shot wasn’t guaranteed to be aired. As a result, quotes ranged from 4.00 up to 101.00. It was a perfect example of underweighting a rare event. One of the golden rules of gambling is that any bet should be assessed in terms of Expected Value – the average of outcomes each weighted by probability. Unfortunately, bettors tend to assign weightings to bet options based on how they feel about the probabilities, resulting in the Possibility and Certainty Effects, which can prove very costly.